For starters you will learn how to create some scatter brushes and how to build the main shapes using a smooth font, the 3D Extrude & Bevel effect and some basic vector shape building techniques. Moving on you will learn how to add shading and highlights for these shapes using the Appearance panel and basic blending techniques. Next, you’ll use those scatter brushes along with some basic masking and blending techniques. 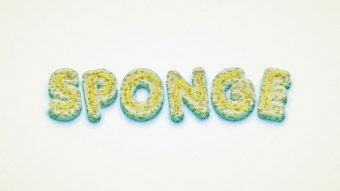 Using two built-in patterns and simple raster effects you will learn how to add a subtle texture for your entire text. Finally, you will learn how to add some detergent using a built-in calligraphic brush, the Roughen effect and the Appearance panel. Hit Control + N to create a new document. Select Pixels from the Units drop-down menu, enter 600 in the width box and 400 in the height box then click on the Advanced button. Select RGB, Screen (72ppi) and make sure that the Align New Objects to Pixel Grid box is unchecked before you click OK. Enable the Grid (View > Show Grid) and the Snap to Grid (View > Snap to Grid). You will need a grid every 1px, so go to Edit > Preferences > Guides > Grid, enter 1 in the Gridline every box and 1 in the Subdivisions box. Try not to get discouraged by all that grid, it will ease your work and keep in mind that you can easily enable or disable it using the Control + " keyboard shortcut. You should also open the Info panel (Window > Info) for a live preview with the size and position of your shapes. Do not forget to set the unit of measurement to pixels from Edit > Preferences > Units > General. All these options will significantly increase your work speed. Pick the Ellipse Tool (L) and focus on your Toolbar. Remove the color from the stroke then select the fill and set its color to R=237 G=28 B=36. Move to your artboard and create a 10px circle, the Snap to Grid feature should ease your work. 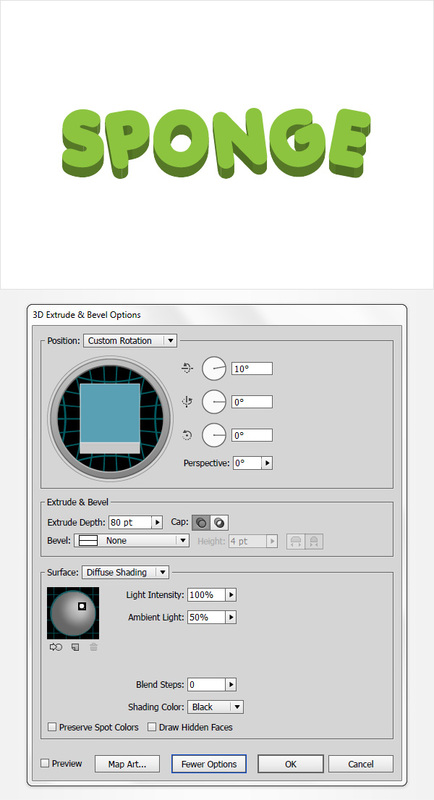 Make sure that this red shape stays selected, open the Brushes panel (Window > Brushes) and click the New Brush button. Check the Scatter Brush box, click OK and focus on the newly opened window. Type the name of your brush ("redBrush"), make sure that you enter all the properties shown in the following image then click the OK button. Once you can see this new scatter brush inside your Brushes panel you can get rid of that red circle from your artboard. Reselect the Ellipse Tool (L), focus on your Toolbar and replace the existing fill color with R=39 G=170 B=225. 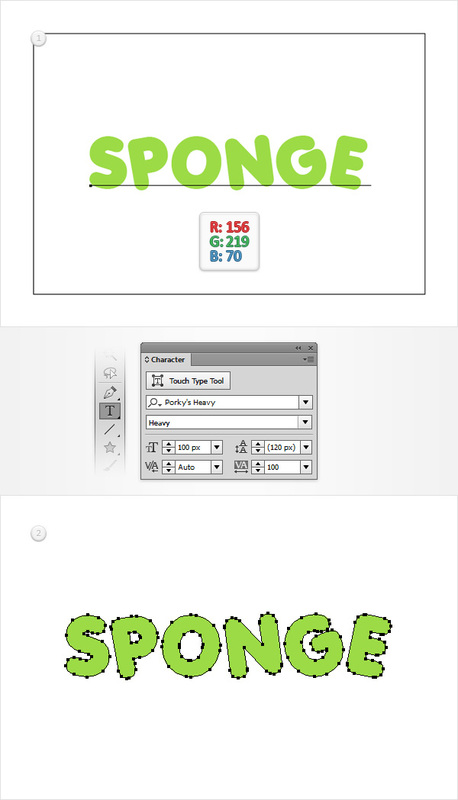 Move to your artboard and simply create a 4 x 6px shape. Make sure that this blue shape stays selected, return to the Brushes panel and click again on that New Brush button. Check the Scatter Brush box, click OK and focus on the newly opened window. Name this new brush "blueBrush", make sure that you enter all the properties shown in the following image then click the OK button. Once you can see this new scatter brush inside your Brushes panel you can get rid of that blue shape from your artboard. Disable the Grid (Control + ") and the Snap to Grid (Shift + Control + ‘). 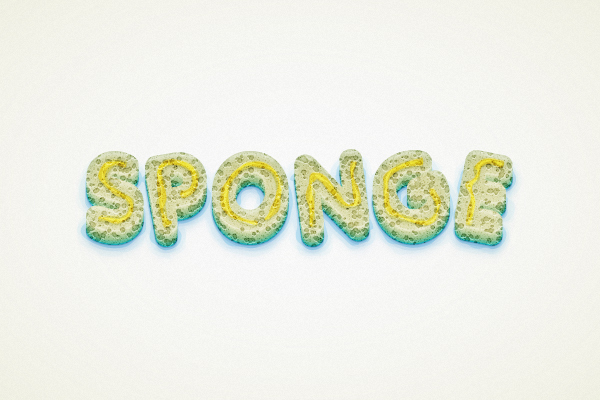 Pick the Type Tool (T), click on your artboard and add the "SPONGE" piece of text. Use the Porky’s Heavy font with size and tracking set at 100 then make sure that the text color is set to R=156 G=219 B=70. Make sure that your piece of text is selected and go to Type > Create Outlines. Select the resulting group of shapes, hit Control + G to Ungroup it then hit Control + 8 (or go to Object > Compound Path > Make) to turn your green shapes into a simple compound path. Make sure that your green compound path is still selected and go to Effect > 3D > Extrude & Bevel. Click the More Options button, enter all the attributes shown in the following image then click OK.
Reselect your green compound path and go to Object > Expand Appearance. Make sure that the resulting group of shapes is selected and hit the Shift + Control + G command three times. 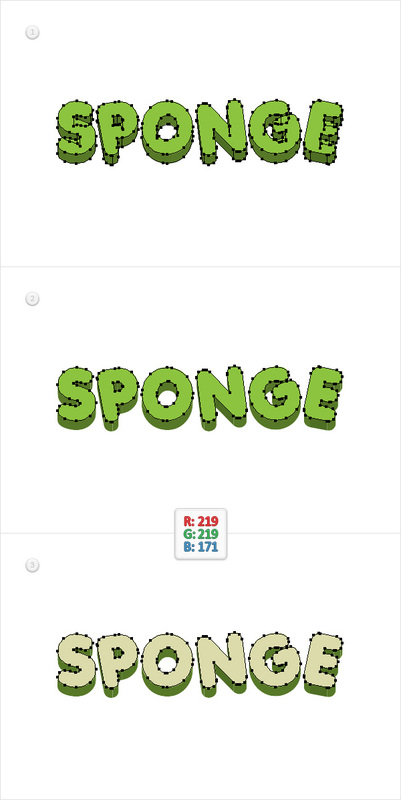 Now, select the six shapes that make the front side of your letters (highlighted in the second image), turn them into a new compound path (Control + 8) and replace the existing fill color with R=219 G=219 B=171. Focus on the Layers panel (Window > Layers), open the existing layer, find the compound path made in this step, double click on its name and rename it "FRONT". Select all the shapes that make up the lateral side of your letters (basically all the shapes made so far except that "FRONT" compound path), click the Unite button from the Pathfinder panel (Window > Pathfinder) then turn the resulting shapes into a new compound path (Control + 8). Focus on the Layers panel, rename the compound path made in this step "SIDES" and make sure that it lies below your "FRONT" compound path. Reselect your "FRONT" compound path, make a copy in front (Control + C > Control + F), select it and replace the existing fill color with R=111 G=173 B=111. Move to the Layers panel and rename this new shape "BACK". Select it along with your "SIDES" shape, make sure that the Selection Tool (V) is active, click on your "SIDES" shape (it should get emphasized) then open the Align panel (Window > Align) and click the Vertical Align Bottom button. In the end your "BACK" shape should be placed as shown in the third image. Make sure that it’s still selected and hit Control + [ to send it behind your "FRONT" shape as shown in the fourth image. Reselect your "BACK" shape, make a copy in front (Control + C > Control + F) and send it to back (Shift + Control + [ ). Move to the Layers panel and rename the copy made in this step "SHADOW". Make sure that it stays selected and focus on the Appearance panel (Window > Appearance). Select the existing stroke, make it black (R=0 G=0 B=0), set the Weight to 1px and lower its Opacity to 10%. Make sure that this subtle stroke is still selected and duplicate it using the Duplicate Selected Item button. Select the new stroke, lower its Opacity to 5% and increase the Weight to 2px.